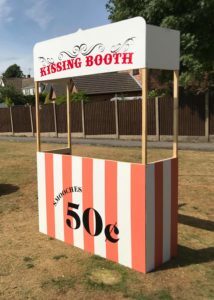 Hire our Kissing Booth as a stand alone prop that your guests can interact with & get some great pictures on their mobile devices. 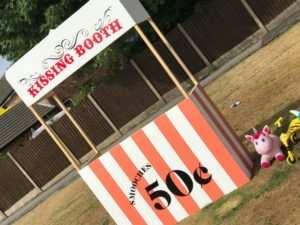 The best events offer your guests something fun thats a little bit different & hiring a Kissing Booth is very unique & fulfils that need. 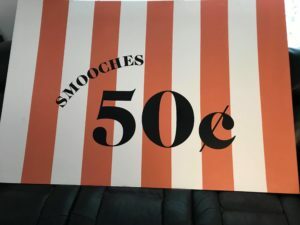 Roll up, roll up, & get your kisses here! 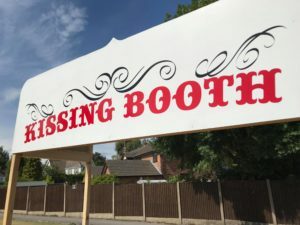 Kissing booths are a traditional idea in which the booth holder offers kisses in exchange for a small sum of money. ‘Gimme a buck and pucker up’ was the cry at these sideshow attractions back in the day. They are a great way to raise funds for charity, especially if an attractive person or even a celebrity is present to provide the kisses! A kissing booth is perfect at weddings, of course, for the happy couple to be photographed in, & any guests who feel like a snogfest too. On such occasions the fee can be waived & the kissing can happen just for fun. For newlyweds & other couples, kissing booths never fail to give the ‘awww!’ factor. Our kissing booth can be set up indoors or outdoors. It doesn’t require power, so it can be set up pretty much anywhere. Made of wood, it won’t wobble in a breeze & won’t blow over in anything less than a storm. We can’t guarantee it is fully resistant to unbridled passion, though. Light petting only, please! This is a great ice breaker & allows the official photographer to get some unique snaps. You may also want to add this to a Photo Booth Package. Why not add us on Facebook & Instagram to keep up to date with our latest events. You can see even more pictures & quickly ask us any questions you may have about your own event on our social pages!